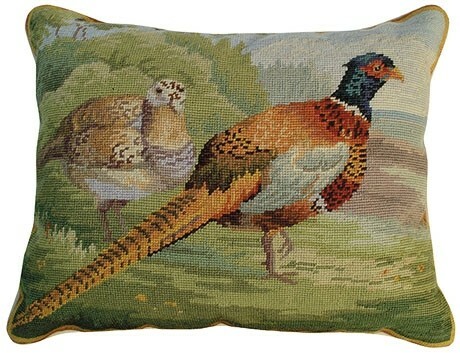 This needlepoint Pheasants in Field Pillow shows the strong featured Ring-necked pheasant. They are found from New England to California (mostly in the northern tier of states) with a major concentration in the Dakotas. 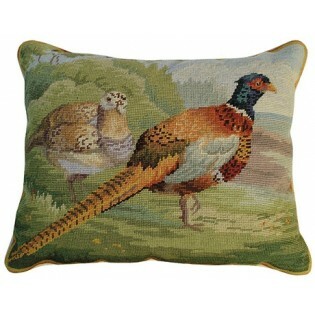 This needlepoint Pheasants in Field Pillow shows the strong featured Ring-necked pheasant. They are found from New England to California (mostly in the northern tier of states) with a major concentration in the Dakotas. State bird of South Dakota. Backing is beige velvet with a zipper.